The switch has been thrown to light up the new biomass boiler at the Geoff Moulder Leisure Complex – the latest advance in a number of green efficiency measures by Boston Borough Council. The 500kw boiler is fed automatically from a hopper using quality wood chip from sustainably managed woodlands. Heat transfer from the boiler will heat the pool water, domestic water such as the showers and heat the building. 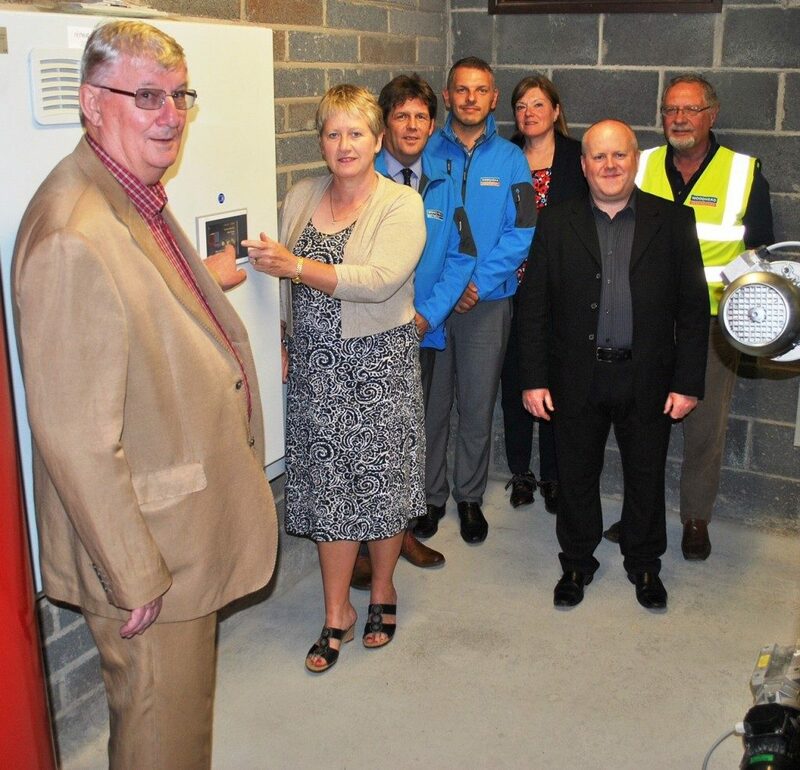 Throwing the switch were Boston Borough Council leader, Cllr Peter Bedford, and portfolio holder for leisure services, Cllr Claire Rylott and staff from Robert Woodhead Limited, the construction company. The project, procured through the empa ii Minor Works Framework means the council will be eligible for Renewable Heat Incentive, providing a long-term income stream to help subsidise services. The centre’s energy needs are also already supplemented by two rooftop solar arrays, taking free energy from the sun. Since the Geoff Moulder solar panels were installed in 2012 and 2014 they have provided Boston Borough Council with a £100,000 boost. Robert Woodhead Limited have completed a number of other sustainable projects in Lincolnshire, procured through the empa ii Minor Works Framework including a programme of LED lighting upgrades to 31 sheltered living complexes for South Kesteven District Council and a Co-location scheme for the City of Lincoln Council which included the addition of new solar panels. In addition, Woodhead also installed a 500kw biomass boiler at the Princess Royal Sports Arena, replacing costlier LPG – the site is not on mains gas. Fuel for the two leisure sites is being provided by Nottinghamshire Eco Fuels, who are working with a local company to provide the deliveries. Once burned the ash from the wood chip will be used as a soil improver in the community gardens. Since solar panels were switched on at the Princess Royal Sports Arena last June there has been an additional saving of £5,150, plus energy generation worth £6,200 for the period up to March 31. That green-energy project is aimed at making and saving cash for the council to pay for repairs and improvements at the centre. The cost of the solar system was £104,000. Sport, leisure and recreation experts 1Life have now taken on full responsibility for the centre. The council will fund repairs and improvements to bring the centre up to an improved handover condition – costs covered by savings made by the energy efficiency improvements. The sport, leisure and recreation experts have a full repair and renew lease for the site, relieving borough council tax payers of any future financial responsibility. The biomass investments at GMLC and PRSA are expected to pay back within eight to nine years.